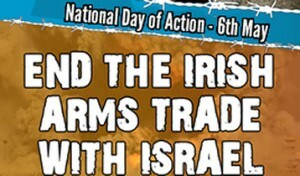 The weekend of 6-7th May will see IPSC branches hitting the streets all over Ireland in a national action collecting signatures to our petition calling on the Irish government to ‘End the Irish Arms Trade With Israel’. It’s a timely action as just this weekend news broke that the Irish Defence Forces had purchased four new surveillance drones from Israel – these are military items that have been tested by terrorising Palestinians. If you haven’t signed and shared the online petition, please do so by clicking here, thanks! Also, on Saturday 13th to mark the 69th anniversay of the Nakba, the Clare branch will be hosting a petition sign on between 11am and 1pm in O’Connell Square, Ennis.